Fate and adventure collide in the epic and awe-inspiring story of Judah Ben-Hur (Jack Huston), a prince who is enslaved by the Romans after being betrayed by his adopted brother Messala (Toby Kebbell). Separated from his family and the woman he loves, Ben-Hur is rescued from near death by the mysterious Ilderim (Academy Award winner Morgan Freeman). He returns to his homeland seeking revenge against his brother and an empire, but instead he finds a chance for redemption. Falsely accused of treason and stripped of his title, Judah Ben-Hur’s wife and family are slaughtered and he is forced into a life of slavery, aboard a Roman galley ship. After enduring five years as a slave at sea, Ben-Hur escapes during a naval battle when his galley is destroyed and clinging to a ship mast for life he, he washes ashore. Ben-Hur is found by Sheik Ilderim and brought back to his camp, where he proves his value when Ilderim’s horses run loose and it is Ben-Hur that manages to rein them in. Ilderim decides to train Ben-Hur to compete in a chariot race with Messala to reclaim his honour. The 'Ben-Hur' competition has now closed. Winners will be announced shortly. Competition opens at 5pm AEDT on Sunday 27th November 2016 and closes at 11:59pm AEDT on Sunday 4th December 2016. Five winners will be chosen at random on Monday 5th December 2016. To successfully win, entrants must fulfil the above entry conditions before the time the competition closes. Current members/followers are eligible to enter the competition. Only one entry per person. Only one winner per household. To be a valid winner, the entrant must not have won a prize from SWITCH within the last 28 days. Each winner will receive one Blu-ray copy of 'Ben-Hur'. By entering, you agree to receive occasional emails from SWITCH in the future. If you decide to unsubscribe from these updates, any further entries will not be applicable. Only Australian residents are eligible to enter. 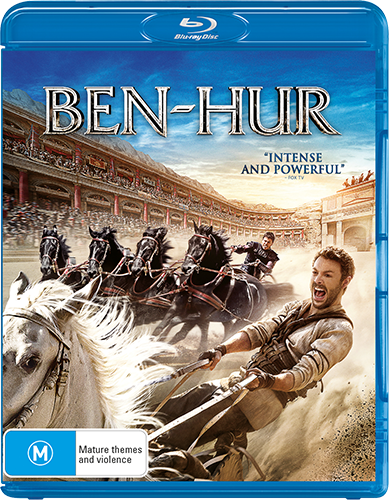 'Ben-Hur' is available on Blu-ray and DVD on Thursday the 1st December 2016 from Universal Sony.